In this tutorial you will learn how to use the REPLACE Function. The REPLACE function returns a String in which a specified substring has been replaced with another substring a specified number of times. find the string you are searching for. start where to start the search. count the number of replacements you wish. compare the type of comparision. In this example we will work with the words "Access Learning". 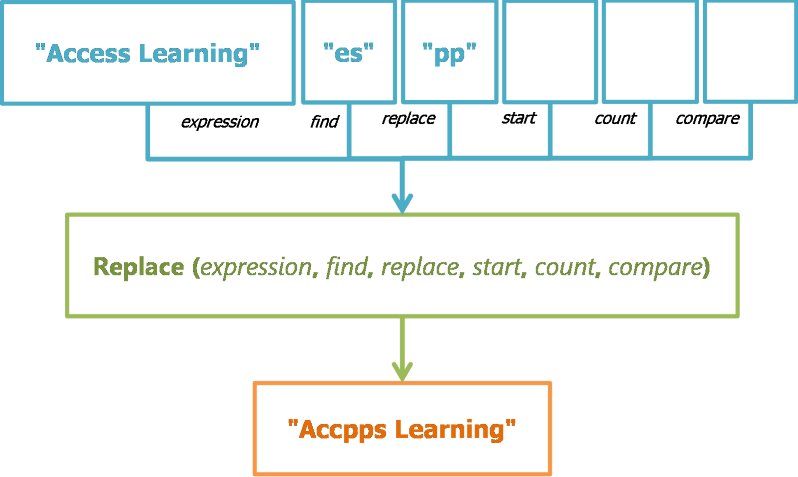 The result is "Accpps Learning". vbUseCompareOption -1 Performs a comparison using the setting of the Option Compare statement. replace is zero-length Copy of expression with all occurances of find removed. In a Form add a TEXTBOX control and rename it "txtReplace", then you could add the following in the Load Event.